We’d love your help. Let us know what’s wrong with this preview of Little Women of Baghlan by Susan Fox. A forgotten diary…Afghanistan during the Cold War…and a young American volunteer. Fifty years later, Jo Carter’s diary is a window to the past, and the source material for this narrative nonfiction book. Jo deploys to Baghlan with the Peace Corps in 1968, before the Russian invasion or the emergence of the Taliban. She lives with two co-workers in a home that is made of ado A forgotten diary…Afghanistan during the Cold War…and a young American volunteer. Fifty years later, Jo Carter’s diary is a window to the past, and the source material for this narrative nonfiction book. Jo deploys to Baghlan with the Peace Corps in 1968, before the Russian invasion or the emergence of the Taliban. She lives with two co-workers in a home that is made of adobe, and shares her kitchen ceiling with a family of swallows. She teaches in Farsi, shops the bazaar, cooks on a bokhari, and hosts a Thanksgiving dinner for their Afghan neighbors. She dances, drinks, and parties with a group of German volunteers, works in a hospital with no running water, delivers babies, and adopts a juie puppy. Over a period of two years Jo never tires of the rugged beauty of Afghanistan, and comes to love her young Afghan students. Her story is a reminder of a time when our country was truly great; when generosity, sacrifice, and tolerance were part of our national vocabulary. To ask other readers questions about Little Women of Baghlan, please sign up. There was so much potential in this book - it follows the experiences of a young American woman named Joanne Carter, who volunteers with the Peace Corps during the 1960s and winds up in Afghanistan. As a historical artifact, it's a gem - her detailed journals, letters to loved ones, and other mementos help the author, Susan Fox, piece together a picture of the mid-century Afghanistan that has long since disappeared under layers of war and suffering. But I couldn't help but wish that the work had There was so much potential in this book - it follows the experiences of a young American woman named Joanne Carter, who volunteers with the Peace Corps during the 1960s and winds up in Afghanistan. As a historical artifact, it's a gem - her detailed journals, letters to loved ones, and other mementos help the author, Susan Fox, piece together a picture of the mid-century Afghanistan that has long since disappeared under layers of war and suffering. But I couldn't help but wish that the work had been crafted by a trained historian. There's no attempt to ferret out layers of meaning in the texts available, little in the way of historical context that would help the reader understand the socio-political picture of Afghanistan during this era or the importance of the Cold War in Afghanistan's convoluted progress, and an overall lack of critical analysis. The biases of young Jo are just accepted by the author with nary an investigation into the ways in which Jo's own sheltered American upbringing likely colored her experiences and treatment in country. This is an absolutely fascinating insight into life in Afghanistan before the Soviet invasion and the rise of the Taliban. Fox brilliantly retells the story of Jo, a Peace Corps volunteer in Afghanistan. 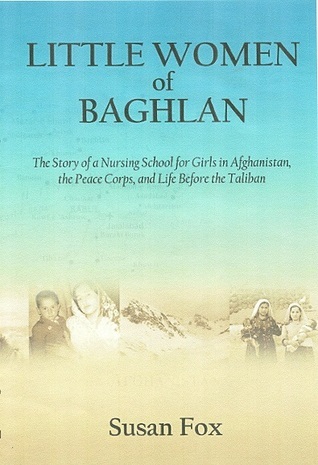 By the end of the book, I felt that I personally knew the volunteers and Afghans of Baghlan. My only minor issue was that it was perhaps a bit too long, but that did not take away from the impact of the book. Also got to hear the author speak which really adds to everything. I was wrong. I THOUGHT this was a book about history, nursing and the Peace Corps. It turns out it was also about teaching. Now I’m a blubbering mess. Wonderful true story! I was fortunate enough to receive a free copy of this book. Thank you, Susan, for this! However, I have not let this influence me in my review. 'Little Women of Baghlan' tells the story of the period of just more than two years that Susan Fox's great friend, Jo Carter, spent in the United States Peace Corps. I found this book to be interesting, informative and very enjoyable to read. Susan makes it a point not to be too political with her detailing of Jo's story, allowing it to be more a story fr I was fortunate enough to receive a free copy of this book. Thank you, Susan, for this! However, I have not let this influence me in my review. I found this book to be interesting, informative and very enjoyable to read. Susan makes it a point not to be too political with her detailing of Jo's story, allowing it to be more a story from the heart of Jo's actual experiences with the people she met, especially during her major deployment to a remote village of Afghanistan, Baghlan. Although Jo and the two friends she shared a house with in Baghlan (Nan and Mary) certainly experienced difficulties in initially becoming accepted by the locals, finding a house (it was a case of who you know rather than what you know) and commencing the nursing school, they soon felt a warmth for the people of Baghlan. You soon feel that although the community of Baghlan may have been lacking in material riches, this was more than made up for through the richness of their kind hearts and souls. As a reader, it is hard not to feel love and empathy for the young girls at the school and even for Jo and Nan as they attempted to educate them in nursing practices. In the end, it is possible that Jo learnt more from the girls about life than they did from her about nursing. There are also numerous stories about their encounters with other local Afghanis and the way in which they were eventually accepted as 'us' rather than 'them'. As stated earlier, Susan tries to steer clear of much of the political matters of the time. However, she does contrast the 'westernised' culture with the Muslim Afghani culture. This helps the reader gain an understanding of some Muslim customs, something that is very much needed in today's somewhat broken society. We need to all accept that we are more similar to one another than different from one another and live with tolerance and acceptance rather than distance and fear. Susan does express Jo's empathy for the lives of Afghani women though and, in particular, their status (or lack of) within marriage. However, she does balance this with expressing why certain customs take place and how they may not be as bad as they appear on the surface. For instance, re arranged marriages, a young Afghani girl about to be married expresses that her parents know her even better than she does herself and, out of love for her, would find a partner who loved her and suited her. I really liked this book, based on a Peace Corps nurse's diary. It reads like a novel, with nicely imagined scenes and dialogue. Great way to learn the historical/political situation in Afghanistan in 1968-1970. Also learned more about Islam, and how the oppression of women does not really come from that but from laws, etc. This one I read with 2 bookmarks--one in front, chapter by chapter, and one in back, in the notes. I loved this book, it gave me an understanding of life in Afghanistan before Russia and the Taliban and the US, Australia and Allied countries got involved. I understand a lot more about the culture that is so anti female and really has always been. From a nursing perspective and as an RN I could truly relate to the professional dilemma these American women faced during their times dealing with the "health system" of this country. This was by far one of the best books I have read & throughly enjoyed! I even have tears at the ending. I never really thought about the Peace Corps and what it entailed. What amazing work they do and what hardships they struggle through. This book made me realize that I expect and demand in my daily life, just because it has always been available. I hope I can pay more attention to what is happening around me, now! Just found out I have won this book, looking forward to reading this one. Stay tuned for a review and happy reading! Susan Fox did an excellent job in researching and writing this very interesting true story. Interesting depiction of 2 years spent as a nurse educator in Baghlan. So much to learn about a culture that is different from my own. It was a fair book. Interesting to learn about Afghanistan but never really got real deep into the culture. Peace Corps aspect was good to read about. Overall, a slow book with really no excitement. Author Susan Fox lives along the Kankakee River in Momence, IL--a small town of 3,000, not counting the duck population. "Little Women of Baghlan" is her first book, and was named as a finalist for Book of the Year in nonfiction by the Chicago Writers Association. Susan holds a bachelor’s degree in psychology from the University of St. Francis, Joliet, Illinois, a nursing degree, and a certificate Author Susan Fox lives along the Kankakee River in Momence, IL--a small town of 3,000, not counting the duck population. Susan holds a bachelor’s degree in psychology from the University of St. Francis, Joliet, Illinois, a nursing degree, and a certificate in technical writing from the Illinois Institute of Technology in Chicago. When she is not writing, Susan divides her time between her six grandchildren, her husband Ken, and her clarinet.